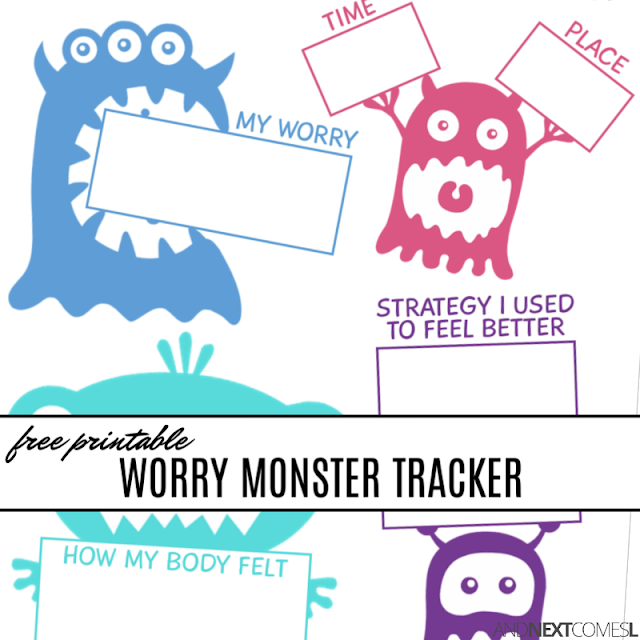 Help your kids deal with anxious thoughts and worries by filling in this cute free printable worry tracker sheet. It's a super cute coping with anxiety worksheet for kids. We all worry about things at some point, but some people worry more than others. So if you have an anxious child that worries about all sorts of things, then you're not alone! Your child just might need some extra help managing their anxiety. This free printable worry monster tracking sheet for kids is a great way for your kids to keep track of their worries. It also allows them to keep track of what strategies have worked to cope with the anxious thoughts. This one page printable features four colorful monsters holding up signs that your kids can fill in to keep track of all their worries, when they happened, what it felt like, and how they coped with the anxious thought. You'll want to print off multiple copies of this tracking sheet and assemble them into a duotang or binder so that your kids can fill them in one worry at a time.